The Cro-Magnons form the earliest known examples of Homo sapiens sapiens, the subspecies to which modern humans belong. Archaeologists believe them to have lived from about 45,000 to 10,000 years ago in the Upper Paleolithic period of the Pleistocene epoch. For all extents and purposes these people were anatomically modern, only differing from their modern day descendants in Europe by their slightly more robust physiology and brains which were about 4 percent larger than that of modern man. The Cro-Magnons could be descended from any number of subspecies of Homo sapiens that emerged from Africa approximately 100,000 thousand years ago, such as Homo sapiens idaltu. The geologist Louis Lartet discovered the first five skeletons in March 1868 in the Cro-Magnon rock shelter at Les Eyzies, Dordogne, France. The definitive specimen from this find bears the name 'Cro Magnon I'. The skeletons showed the same high forehead and upright (gracile) posture as modern humans. Other specimens have since come to light in other parts of Europe and in the Middle East. The European individuals probably arrived from north Africa and (via?) the Middle East. Surviving Cro-Magnon artifacts include huts, paintings, carvings and antler-tipped spears. The remains of tools suggest that they knew how to make woven clothing. The Cro-Magnon have associations with the Aurignacian culture that archaeology had identified before Lartet found the skeletons. CROMAGNON RACE, the name given by Paul Broca to a type of mankind supposed to be represented by remains found by Lartet, Christy and others, in France in the Cromagnon cave at Les Eyzies, Tayac district, Dordogne. At the foot of a steep rock near the village this small cave, nearly filled with debris, was found by workmen in 1868. Towards the top of the loose strata three human skeletons were unearthed. They were those of an old man, a young man and a woman, the latters skull bearing the mark of a severe wound. The skulls presented such special characteristics that Broca took them as types of a race, Palaeolithic man is exclusively long-headed, and the dolichocephalic appearance of the crania (they had a mean cephalic index of 73.34) supported the view that the find at Les Eyzies was palaeoiithic. It is, however, inaccurate to state that brachycephaly appears at once with the neolithic age, dolichocephaly even of a pronounced type persisting far into neolithic times. The Cromagnon race may thus be, as many anthropologists believe it, early neolithic, a type of man who spread over and inhabited a large portion of Europe at the close of the Pleistocene period. Some have sought to find in it the substratum of the present populations of western Europe. Quatrefages identifies Cromagnon man with the tall, long-headed, fair Kabyles (Berbers) who still survive in various parts of Mauritania. He suggests the introduction of the Cromagnon from Siberia, arriving in Europe simultaneously with the great mammals (which were driven by the cold from Siberia), and no doubt following their route. 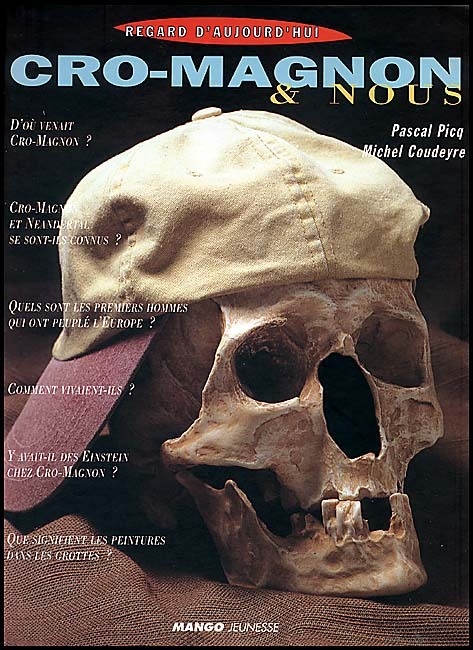 The second skull is the Cro Magnon type of Baoussé-Roussé at the Italian Riviera, its traits more attenuated, more orthognath and also in stature extraordinary tall(an average of 187cm). Montandon poses the question if these tall people weren't a social elite or belonged to a higher caste. He minds the East African chieftains like the Batusi and Bahima, who used to pronounce their superiority over a mass of subuded and racially different people. The traits are more refined and their stature as a rule greater than that of the lower class. However, corpses of a supposed servile people is not attested, but, very cunningly, Montandon brings the example in of the Massai: the chiefs are intered, the commoners'bodies are thrown to the hyenas. But those stratified societies are only possible because they are pastoral. The statue of the Cro-Magnon looks a bit like some American Indian types, to me. It's all in the eyes of the beholder. I wonder whether this old reconstruction is accurate. I think the Old man is just a very exaggerated type with extreme features. Kind of like myself. Not a pretty sight. Montandon's conjecture is intriguing but so far I am aware of, stratified cultures only emerged as late as the Bronze Age under influence of the Bell Beaker folk, but real social classes were probably initially never very stringent and the Bell Beakers acted in a benevolent, enlightened manner, securing the trading channels throughout Europe as a supranational warrior-élite standing. This said, their superiority could have been addressed in making sure that their mould and bearing would not suffer any form of miscegenation to ensure that their character and spirit would be untouched by alien elements. Clan-allegiance and totemism are primitive forms of association connected to hunter-gatherers. The allegiance is the sense of belonging to some mystified past and origin, idolized and identified by blood relation. This bond explains a distinct, unique state which magically flows through their body and emulates in the individual in a particular physical appearance and countenance. Forces and gifts connected to this ancestral spirit, an engine of forces able to change the nature and order of things, people and environment, have a physical carrier, are expressed by this racial physique. So, by clinging to this totem, it's necessary to withstand mongrelisation. And proliferate the distinct markings which sets apart the clan from other tribes. Social domestication and strict endogamy should be entitled as primal means by which the physical status could be enhanced and refined, and some sort of religious belief as core motivation. The mind ruling the body. It is interesting how different it is e.g. from the ancient Swedish brachycephalic skull in Vellinge. The vertex is clearly lower than bregma while in the skull of Vellinge the situation is the opposite. The Vellinge skull represent the same race as Borreby. The skull of Vellinge is also very ridged but the crown of the Cro Magnoid in the second picture is very flat. Here one can see that Borreby and Cro Magnoid are different and should not be confused. Cro Magnoid is always long headed and Borreby is short headed and high skulled. What they do share is the low and broad face with projecting zygomata. They are also more lateral. (C. M Fürst: Zur Kraniologie der schwedischen Steinzeit). What confuses me about these Cro Magnoids is the position of the jaw, that I see some prognathism. I do not see alveolar progantism, just that the chin jut out, and I wonder what the angle is. One could find out, it is a horizontal line through the outer ear and the lowest point of the eye socket, and a profile line from the nasal root (nasion) to the frontal point between the jaws frontal teeth (incision superius or prosthion). Now if the profile angle is 83-90 degrees we have orthognathism, under 82 prorgnathism. In the former the facial profile stand practically vertical. In the latter the jaws jut forward. Europids (modern) tend to be orthognathous, Negrids and Australoids are as a rule prognathous, Mongoloids partly orthognathous and prognathous. Last edited by Glenlivet; Wednesday, May 5th, 2004 at 02:41 AM. The last picture looks general European or Europoid. I think most skulls attributed to the Cro-Magnon type had maxilla that projected somewhat. Both the Bruenn and Borrerby seem to have had low, square orbits and vertical foreheads. The Predmost male skull, Skuhl 4, and maybe some others don't seem to fit either type. Cro-Magnon is the name of a rock shelter near Les Eyzies-de-Tayac, Dordogne, Fr., where several prehistoric skeletons were found in 1868. Sent to the site, the French geologist Louis Lartet began excavations in which he established the existence of five archaeological layers covered with ash. The age of the human remains found in the topmost layer—along with worked flint and the bones of animals of species now extinct—is Upper Paleolithic (c. 35,000–10,000 years ago), but the attribution of these to a clearly defined Upper Paleolithic culture is less definite. Traditionally regarded as Aurignacian, since typically Aurignacian artifacts were found in the rock shelter, they could be more recent, and it has been suggested that they should be assigned to the Perigordian (a separate industry covering approximately the same time period as the Aurignacian), which would give an age of about 25,000 BC. Although it appears that at the time of discovery the remains of more than 10 individuals existed at Cro-Magnon, only fragments from some five individuals were preserved and studied, among them the cranium and mandible of a male about 50 years old. Considered representative of the Cro-Magnon type, this specimen is known as the “Old Man of Cro-Magnon.” Also preserved were skull fragments of about four other individuals, some bits of bone from a fetus or newborn child, and an assortment of bones attributed variously to the individuals mentioned above. The first subject mentioned, the Old Man of Cro-Magnon, has been regarded as typical of the Cro-Magnon peoples. The skull is longheaded (dolichocephalic) and as seen from above has a pentagonal outline, with outward bulging of the parietal bones (at the sides of the skull). The forehead is straight, the browridges only slightly projecting, the cranial vault noticeably flattened, and the occipital bone (at the back of the head) projects backward. The cranial capacity is large, about 1,600 cubic centimetres (about 100 cubic inches). Although the skull is relatively long and narrow, the face appears quite short and wide. This combination is often regarded as a common feature of the Cro-Magnon race. The forward projection of the upper jaw (maxilla) is also distinctive. The eye sockets are low-set, wide, and rather square in shape; and the nasal aperture of the skull is narrow and strongly projecting. The mandible is robust, with massive ascending ramus (the upward projection of the lower jaw, where it attaches to the skull), strongly developed points of muscular attachment, and a quite prominent chin. The root of only one molar tooth remains in the jaw of the Old Man of Cro-Magnon, a fact that contributed to the idea of his advanced age. In fact, it is probable that the loss of the majority of his teeth occurred after death. The teeth of the other individuals found at Cro-Magnon, which are similar to the teeth of other fossil humans classed as Cro-Magnon, show that the dentition of Cro-Magnons was nearly identical to that of modern humans. Most of the teeth recovered, however, especially the last molars, are distinctly larger than those of most modern peoples. Dental caries is sometimes apparent, and tooth wear is often extreme. The remainder of the Cro-Magnon skeleton is not fully known from the remains found at the original site, which are incomplete and poorly preserved. Skeletal material attributed to the Cro-Magnon race from other sites, however, affords the general impression of robustness, probably combined with powerful musculature. The forearm is relatively long, as is the thigh; the femur (thighbone) has a very prominent linea aspera (a bony ridge that runs lengthwise down the back of the femur), and the tibia is flattened from back to front (platycnemy). The hand skeleton is large with short fingers, and the foot has a prominent heel. Early investigators were impressed by the stature of Cro-Magnon man, as some reconstructions suggest that the Old Man of Cro-Magnon may have been as much as 190 centimetres (six feet three inches) tall. A restudy, however, suggests that the stature of the original Cro-Magnon remains varied from 166 to 171 centimetres (five feet five inches to five feet seven inches). The stature of several skeletons from the Grimaldi Caves (in Italy, near the French frontier), which show clear affinities to those of Cro-Magnon, was noticeably greater, with an average height of 177 centimetres. It is thus reasonable to conclude that, on the whole, the Cro-Magnon peoples were relatively tall. Lesions noted in the Cro-Magnon skeletal remains have been attributed to wounds, but one analysis has suggested that these lesions are pathological in origin and may have resulted from the action of a toxic mushroom, Actinomyces israeli. Two French prehistorians, A. de Quatrefages and Ernest Hamy, in 1882 took the Cro-Magnon fossils to be prototypes of a Cro-Magnon race. As opposed to the Neanderthal race—the first remains of which were found about 25 years earlier—the Cro-Magnons were then considered to be the most ancient form of Homo sapiens. To the Cro-Magnons were assigned other remains discovered before 1868 at La Madeleine and Bruniquel, in France; Engis, in Belgium; and Paviland, in Wales. Subsequently, further finds of human skeletal remains extended the geographic range of the Cro-Magnon peoples through much of Europe and into Asia and North Africa. Many of the central European fossils, however, belong to a type that differs from the Cro-Magnons called Brno-Predmosti, named for the area of central Czechoslovakia where they were discovered; like the Combe-Capelle remains, which they resemble, these individuals appear to have more primitive characteristics than typical for Cro-Magnons. The question of the relation of Cro-Magnons to the earliest forms of Homo sapiens is still unclear. It does appear, however, that Cro-Magnons (H. sapiens sapiens) and Neanderthals (H. sapiens neanderthalensis) are closer in affinity than was once believed. It long was thought that certain Cro-Magnon traits could be seen in human remains of Middle Pleistocene age (900,000–130,000 years old), but this argument no longer seems convincing. The tendency now is to locate the origin of the Cro-Magnon type in western Asia, as typified by the remains found at the Jebel Qafzeh and Skhul sites in Israel. Perhaps as complex as the question of origin is that of the duration of Cro-Magnons. It appears that they flourished during the Upper Paleolithic, and that there was a tendency toward more gracile individuals, as seen in the fossils from Saint-Germain-la-Rivière in France. Individuals with at least some Cro-Magnon characteristics—called Cro-Magnoids—are found in the Upper Paleolithic, the Mesolithic (in Europe, c. 8000–c. 5000 BC)—for example, at Muge, Port.—and in the Neolithic (in Europe, roughly from 5000 to about 2000 BC); at the same time, remains have been found for individuals who were quite different, often brachycephalic (broad-headed). Some modern human groups that are more or less homogeneous are thought to have retained a close relationship to Cro-Magnon types, at least in their cranial morphology. Particularly noteworthy are the Dal people from Dalecarlia (now Dalarna, Swed.) and the Guanches of the Canary Islands, the latter of which is said to represent a relatively pure Cro-Magnon stock. The ties between Homo sapiens sapiens, and particularly Cro-Magnon peoples and the various Upper Paleolithic cultures (e.g., Châtelperronian, Aurignacian, and Gravettian, which are classified on the basis of stone and bone tools), are relatively clear, although in 1979 Neanderthal fossils were found in Châtelperronian strata near Saint-Césaire, Fr. It is still difficult to establish precisely an outline of physical types and cultures for this period. Moreover, there are some detectable differences between populations and cultures of western Europe and roughly contemporaneous populations of central or eastern Europe. The Cro-Magnon peoples are generally associated with the Aurignacian culture tool industry, and perhaps with the Gravettian (also called Upper Perigordian). The Aurignacian tool industry is characterized by retouched blade tools, end scrapers and “nosed” scrapers, burins (chisellike tools), and fine bone tools, in particular long, flat points (spearheads) with cleft bases. Other bone and reindeer-horn implements are also seen: awls, tools for smoothing and scraping leather, and the so-called bâtons de commandement—bars of antler or bone with holes drilled in them, the use of which is still uncertain, although they may have been used for straightening arrow or spear shafts. The Gravettian industry differs from the Aurignacian industry in the use of an abrupt retouching technique to form what are called backed blades (i.e., tools with one edge blunted). Modern knowledge of all of these industries has been advanced as the ability to trace how and why various implements were used by Paleolithic peoples has improved. The dwellings of Cro-Magnons were most often caves and shelters made by rock overhangs, but it is apparent that huts were made also; sometimes these were simply lean-tos against rock walls, but foundation stones and “pavements” of stone in the shape of houses are evidence of complete huts. These houses are not a new development with the Cro-Magnons, however; both the Neanderthals and earlier peoples of the Middle Pleistocene are associated with similar remains. It seems probable that the Cro-Magnons lived fairly settled lives. Studies of occupation sites and the types and extent of remains found in these sites suggest that the rock shelters were inhabited throughout the year rather than seasonally, and it is likely that these Paleolithic hunters moved their homes only when hunting or environmental conditions forced them to do so. The climate in the habitable parts of Europe in Cro-Magnon times was cool to cold. Plants and animals of types associated with tundra and steppe environments were usual. Bone remains found at Cro-Magnon occupation sites indicate that they were successful hunters of such animals as reindeer, bison, wild horse, and even mammoth. As yet, very little is known of Cro-Magnon hunting methods—for example, whether hunting was individual or collective or if bows or traps were used. It is obvious from the animal remains, however, that hunting techniques must have been efficacious. Although earlier human groups certainly had religious practices of some sort—the Neanderthal people buried their dead, a practice merely continued and elaborated by Cro-Magnon and later peoples—and no doubt had some appreciation of aesthetics as well, the first examples of prehistoric art are Cro-Magnon. Small engravings, reliefs, and sculptures of animals have been found in Aurignacian and Gravettian sites, as well as a few later statuettes of ivory or stone and occasional engravings in stone of female figures. These figures are usually large-breasted, wide-hipped, and most often apparently pregnant; they are generally assumed to be some sort of fertility symbol, perhaps used in religious or magical rituals intended to promote the fertility of the group or, possibly, of the game. The Cro-Magnon people also appreciated the decorative aspects of art, as demonstrated by their use of animal pictures and (more often) simple geometric designs to ornament tools and weapons. It is believed that the people of the second half of the Upper Paleolithic—i.e., of the Solutrean and even more so the Magdalenian culture—were of the Cro-Magnoid variety and that they were responsible for the many splendid paintings of animals found in caves in France and Spain; but such sculptures as that called the “Lady,” or “Venus,” found at Brassempouy, Fr., are thought to be the work of Cro-Magnon artists. "Human Evolution." Encyclopædia Britannica. 2004. Encyclopædia Britannica Premium Service. Human Evolution. Encyclopædia Britannica. Retrieved April 18, 2004, from Encyclopædia Britannica Premium Service. "human evolution" Encyclopædia Britannica from Encyclopædia Britannica Premium Service. The large male Frans is talking about was actually found very close to the Grimaldi woman and son who were Negroid. I think Atlanto-med is right about no elite being involved. Usually, only a specialized society can be stratified and afford an elite. An Upper Paleolithic society was not stratified unless, possibly, older men stayed at home an made tools.